Travers Waste Services - Rubbish/Waste/Clearance based in Poole, Dorset. 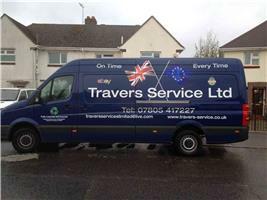 Travers Service Limited was founded 22nd February 2013 and is run by myself Kris Travers. We have now been running for 5 years and become very good at removals In Poole , Bournemouth , Christchurch, Dorset and surrounding area . At Travers Service Limited we love to get dirty so you don't have to. We love to lift and think for ways to get the big awkward item through small door ways. So please take a few minutes and check out my page. This business was set up after I was laid off from my job at a well-established property service company after serving 8 years with them, running their delivery and recycling of building materials, so there's not much I don't know about this business. This is a family run business run by my wife and I, with the view of my son and 2 daughters helping out to run it in time. We treat all our customers the same whether rich or poor, old or young, you will get the same service guaranteed. I cover the whole of Dorset and surrounding areas for rubbish clearances, house moves and deliveries. I am willing to travel further. I take pride and care in every job that I do and aim to ensure every customer is 100% happy with the service they receive. Specialist in helping out clear house when you had bereavement in your family. I am fully licensed and insured to carry waste and goods. All waste is recycled where possible and estimate that over 80% is currently recycled. I offer a free, no obligation quote and will carry out all sizes of jobs, from single items to large warehouses. I operate 7 days a week and aim to complete every job quickly and professionally. Check out my Facebook page and like us and leave comments about what you think of us. Waste , Rubbish , Junk , shed and garage clearance. We collected one item to a full van load.